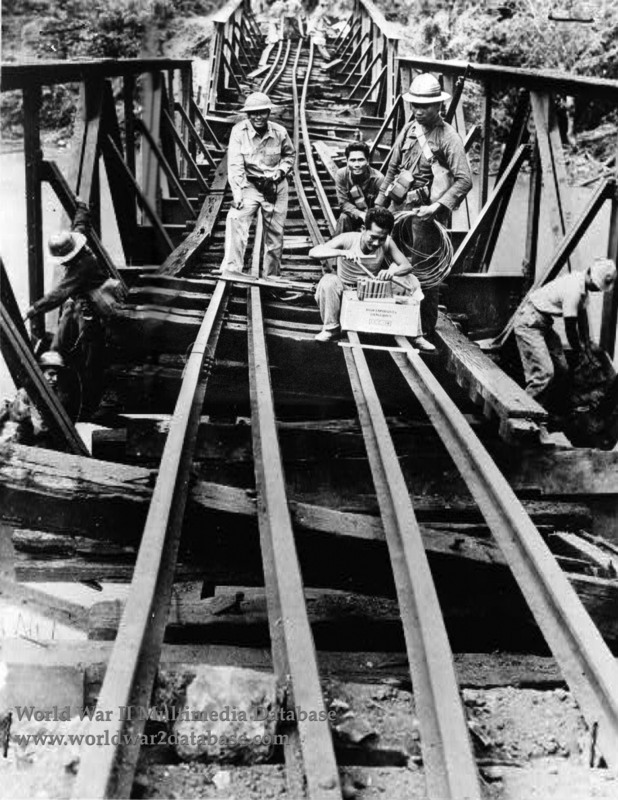 Philippine soldiers of the 14th Engineers, Philippine Scouts, United States Army Forces Far East (USAFFE), prepare a railroad bridge for destruction. Lieutenant Colonel Hugh J. Casey (July 24, 1898 – August 30, 1981), USAFFE Chief Engineer, on December 18, 1941, ordered Lieutenant Colonel Narciso L. Manzano (February 20, 1897 - September 15, 1986) to assist Lieutenant Colonel Harry A. Skerry (May 25, 1888 - October 16, 1978) commander of the 14th Engineer Regiment (Philippine Scouts). They jointly led civilian miners, Bureau of Public Works employees and the Philippine Army in preparing all major highway bridges from the Agno River to the Tarlac River and Cabanatuan. This is probably the special detail consisting of a Second Lieutenant and three miners that Casey sent to the North Luzon Force to prepare the large railroad bridges for destruction. After the Japanese landed in Lingayen Gulf on December 22, 1941, North Luzon Force began retreating to the Bataan Peninsula. Because there were few planes left to interfere with the enemy's progress and because the untrained Philippine troops could not withstand the powerful Japanese onslaughts, Wainwright had to rely heavily on his engineers. It was they who had to keep open roads and bridges ahead of the retreating columns—not an easy task in view of the Japanese supremacy in the air. It was the engineers, too, who had to prepare all bridges for demolition and assure their destruction after friendly troops had passed over. By December 31, Manila was abandoned; as civil engineers blew up stores there to deny them to the enemy, Wainwright's forces were retreating across the Calumpit Bridge. The last units of the USAFFE's two corps crossed by 0500 Hours on January 1, 1942. Skerry delayed blowing the bridge as Manzano's engineer elements were dispersed between Calumpit and Manila. At 0615 Hours North Luzon Force Commander Major General Jonathan M. "Skinny" Wainwright IV (August 23, 1883 - September 2, 1953), who was on site, ordered the Calumpit Bridge to be blown. Manzano was behind the lines working to destroy six bridges between Manila and Bataan. An American engineer, Captain A. Mitchell Major (January 8, 1893 - August 28, 1942) attached to the 202nd Engineer Regiment (Philippine Army) was slightly wounded by Japanese machine gun fire as the sixth bridge blew. Manzano, who was born in the Philippines, could have abandoned Major and blended into the civilian population, but he stuck with the wounded man. They stripped off their uniforms and folded them; carrying them on their heads, they requisitioned a Filipino boat in Manila to get back to American lines. After three months of clearing roads, building fortifications, and fighting the Japanese, Manzano and Major were captured when the Bataan garrison surrendered. Major survived the Bataan Death March but died at Cabantuan. Manzano was trucked to Camp O'Donnell as part of MacArthur's command staff and was appointed Personnel Officer of the Filipino camp at O'Donnell. He risked his life falsifying records to hide large numbers of escaping Filipinos. When he was paroled, he set up an intelligence network in Manila. On January 25, 1944, as Manzano was delivering documents to Mindanao, the Japanese Kempeitai arrested Manzano's wife Rosario G. "Charo" Manzano (October 2, 1906 - October 14, 2001) imprisoning her for the rest of the war. Manzano himself avoided capture and gathered intelligence on Mindanao. His operations assisted MacArthur, with whom he linked up when the Americans landed on Leyte in Octber 1944. Manzano was instrumental in gathering intelligence for the Americans when they landed in Lingayen Gulf in January 1945. After the war, Charo and Narciso Manzano moved to the United States. Special thanks to Allen Manzano and Chris Schaefer for their assistance with this photo.